Atrial fibrillation and oral anticoagulation at onset of stroke represent a frequent challenge for clinicians treating stroke patients during the acute phase (Rizos Cerebrovasc Diseases 2012; Horstmann Journal of Neurology 2013). Our group is dedicated to investigating various aspects of the emergency management and secondary treatment in stroke patients with atrial fibrillation and in neurological patients using oral anticoagulants (Rizos Annals of Neurology 2010; Rizos Stroke. 2009; Laible Cerebrovascular Diseases 2016; Laible Annals of Emergency Medicine 2016). Moreover, we evaluate the role of systemic thrombolysis in specific subgroups of stroke patients (Laible European Neurology 2016). At present, one of our primary aims is to better understand the pathophysiology of atrial fibrillation after stroke (Rizos Stroke 2016) and we aim to improve the acute management of oral anticoagulated stroke patients. For this purpose, we strongly collaborate with different international and national partners. Members of our group represent the core of the large multicentre registry “RASUNOA-Prime” (Register Akuter Schlaganfälle Unter Neuen Oralen Antoikoagulantien; https://clinicaltrials.gov/ct2/show/NCT02533960; Veltkamp Dtsch Med Wochenschr. 2015). Future work will focus on the role of acute stroke treatments in neglected patient groups and we will further evaluate questions regarding the coagulation status in stroke. 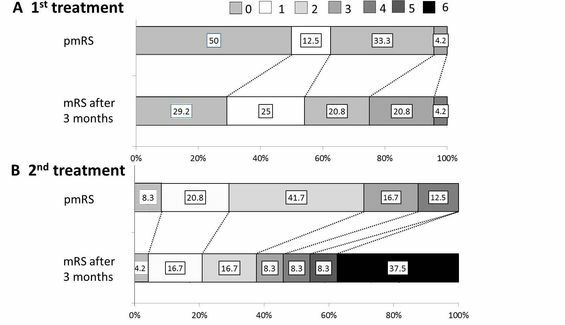 Clinical outcome in patients with acute ischemic stroke repeatedly treated with recombinant tissue-type plasminogen activator (rt-PA) as measured by the modified rankin scale (mRS; Laible Eur. Neurol. 2015). a) mRS before and after the first treatment b) mRS before and after the second treatment.